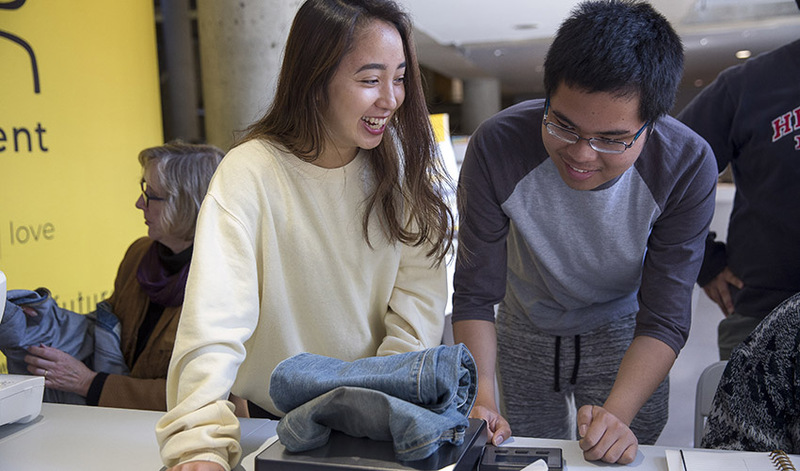 Interior Design major Mana Yamada and Marketing major Jerome Manuel Estacio Pacho weigh clothing brought in by students, staff and faculty. Ever wonder what to do with that old pair of too-tight jeans or the suit jacket you wore to a long-ago job interview? Students and faculty in the Family Interiors Nutrition & Apparel (FINA) department have an answer for you that won’t just free up space in your closet. It could also help fight climate change. With a $60,000 grant from the San Francisco Department of the Environment, Professor of Apparel Design & Merchandising Connie Ulasewicz and former instructor Gail Baugh founded the Wear Movement, a project dedicated to easing the strain on the environment by extending the lifecycle of clothing. Ulasewicz, Baugh, FINA students and student interns from other classes run a weekly pop-up event to collect used, well-loved clothing. Donors rack up “wear bucks” they can use to buy clothes donated by others. Because most used clothing ends up in landfills, the project helps the City of San Francisco meet its goal of zero waste by 2020. Recycling and reusing clothing also reduces the emissions associated with the production of new clothes, which has a huge environmental impact. According to Baugh and Ulasewicz, the textile and clothing industry’s production and consumption patterns are responsible for 25 percent of global greenhouse gas emissions. Every Wednesday between 10:30 a.m. and 2:30 p.m. on the first floor of the Cesar Chavez Student Union, the Wear Movement pop-up shop collects and sells clean clothing that students, faculty and staff contribute. Each month a new category is collected: organizers are asking for clean denim, hoodies and sweaters in October. Blankets will also be collected for a nonprofit that will distribute them to people in need. This spring, Wear Movement events will include suit jackets — just in time for soon-to-be-graduates about to go out on job interviews. And clothing donors won’t just be supplying such students with spiffy professional-looking outfits. Ulasewicz hopes they can provide some good luck, too. “We’re going to encourage people to write a note in the jacket about when they wore it and what it meant to them, so the person who gets it gets a personal connection,” she says. Ulasewicz thinks those kinds of connections could help keep clothing — or other items — out of the waste stream. For instance, an upcoming collection event might focus on backpacks, which would be distributed by a community partner. “What would happen if every student who has an extra backpack donated it and put a note in it [saying] ‘I’m graduating from SF State’?” Ulasewicz said. “It might inspire someone in first grade who gets the backpack. We want to make those connections.” The Wear Movement project plans to partner with other organizations that will distribute the backpacks. The student volunteers and faculty involved in the Wear Movement will be tracking what works and what doesn’t. If successful, the program could be rolled out on other campuses.